The semiconductor manufacturing industry has generated a significant number of acronyms, terms and definitions since its beginnings. NOVA has compiled several documents to assist you in deciphering and understanding these items. Acronyms & Symbols contains chemical abbreviations, manufacturing shortnames, and some codes frequently used in NOVA’s partial inventory listing. Standard Conversions is a short grouping of metric to decimal values. 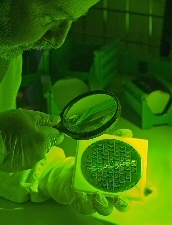 About Silicon has basic information on the properties of silicon, SOI, and II-VI/III-V products. The final document, Terminology of Common Wafer Related Terms, lists many of the common terms and their definition as used in the materials, fabrication and specifications aspects of the semiconductor manufacturing industry. We hope these resource documents will be helpful and beneficial as you browse our website.